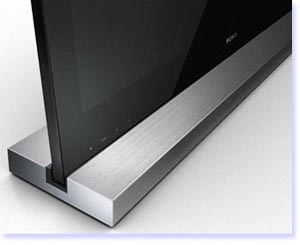 Sony's tilting television is the world's first tilting television ever with amalgamation of Monolithic screen + 3d model can be rested vertically or adjusted to 6 degrees backwards lean according to the convenience of the viewers. "It's exactly the same as sitting in front of a laptop - you tilt the screen back so you can see it properly" Page added. No more stress in seeing the screens in fixed angle for bit more time a comfortable watch, experts see the television as the best angle for comfortable viewing. So, it favors watching from our eye levels lowering towards (backward tilting) the screen but up level? Sony currently has no plans to produce a forward-tilting screen for those who prefer a carpet-level viewing position. Expecting that too, too soon? Though a mount can does this job and fulfill this leaning options but here what Sony does is? It in-build leaning options with in it itself, that sets to be the world's first tilting television. Isn’t it?